SSC Stenographer Grade C and D posts present an exciting opportunity for all those with good typing speed and with knowledge of shorthand. Get here all details of SSC Stenographer 2018 notification. We have 480 more Quizzes on SSC just for you! SSC Stenographer is conducted by the Staff Selection Commission for recruitment of Grade C and D Stenographer Posts. It is an interesting job opportunity for those who are good at shorthand and typing fast in English and Hindi. Get all the related details for SSC Stenographer Exam 2018 below. Recently the Staff Selection Commission had released SSC Stenographer Grade 'C' and 'D' notification. SSC is going to conduct an online Computer-based test for SSC Stenographer Exam 2018. The commission has released the detailed SSC Stenographer Official Notification on 22nd of October 2018. You can, therefore, get all important details on application dates, eligibility, exam dates, exam pattern and SSC Stenographer syllabus for this year. 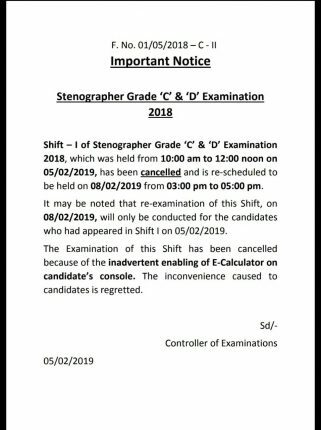 Click on the link below to read the SSC Stenographer Official Notification PDF. The Vacancies of Stenographer Grade “C” and “D” are in Ministries and Departments of Central Government and Subordinate offices across the country. Last year, a total number of 1705 vacancies were announced. This year vacancy details have not been announced yet. To prepare for a highly competitive exam like SSC Stenographer, you must go through the complete syllabus in detail for all the sections. Please go through our blog on SSC Stenographer Syllabus and kickstart your preparation.